Monday night, Evan and I went out to Universal CityWalk to a special IMAX screening of The Dark Knight and an interview with the sound designer, Richard King. It was great to see the movie again — when we saw it during the summer, it was at a theater in Chiang Mai, Thailand, and we were dealing with a major foot odor issue (ours) that was a bit distracting. The movie was incredible in IMAX, on the gigantic screen, though I felt the ferry scene lacked all the suspense it had on the first viewing and also brought down the feeling of suspense and urgency during the concurrent scenes. I also didn’t find it nearly as scary, probably because I knew what was coming around each corner. I did get to appreciate the performances and the story more. The interview afterward was interesting. We learned about some of the different sounds used in the movie and about putting together the sounds for some of the long scenes without music, like the truck chase in the underpass. We also learned about how Richard sometimes finds sounds by accident — like by running his shoe over the end of a treadmill — then starts playing around with the sound to build it into the film. After the movie, we stopped by Comme Ça, a new restaurant and bar on Melrose, for a drink. Evan had been there before, but it was my first time at the beautiful place decorated with lots of dark wood bookcases, small quirky mirrors, and white chairs and benches. We took a seat at the bar, and looked through the drink specials. The place specializes in prohibition-era cocktails, and there’s a nice selection of alcohols from smaller distilleries, and a very inventive drink mix. I tried out a gin-based drink called The Last Word, and Evan was going to have a Sloe Gin Fizz, but since they were out of Sloe Gin, he had a variation on the drink made with Apple Jack Brandy. Watching the bartender — really, mixologist — mix the drinks is a treat in itself. He pours out measurements from beaker-like flasks, hand-chips ice, and shakes everything up in a martini shaker before pouring it into a frosted glass. Our bartender, Eugene, also spent a lot of time talking to us about the different drinks on hand, and he even let us sample and compare a few different whiskeys, brandies and bourbons. We also learned about his favorite tequilas (4 Copas is high on his list) and gins (for peppery, he likes Miller’s, for fruity, Junipero). Since we arrived toward the end of the night — and on a Monday — the bar and restaurant were pretty quiet. I’ve read that it can get pretty busy and noisy in Comme Ça, but for us it was quite a quiet and calm experience. And since the bartender wasn’t overwhelmed, we got a lot of individual attention and really got to see how our drinks were being made. For round two, we let Eugene pick our drinks. Evan got an Old Fashioned, which was a bit too bourbon-heavy for me, but he liked it; I got one of Eugene’s specialties, a drink with lemon, basil, honey and whiskey. It was delicious. He said another bartender calls it the Melrose Smash, but he’s working on a new name. We’ll definitely be back to Comme Ça soon. Next time we’ll have to try some of the food — it’s supposed to be delicious, though unfortunately it doesn’t look very veggie friendly. Sorry I don’t have any photos to share — the movie was supposedly high security (it wasn’t) and they asked us to leave our phones/cameras/etc in the car. I left mine at home. After the USC-Notre Dame game, we went to dinner then changed into some nicer clothes to head out to Hollywood. Though we don’t live too far, we don’t head over there often — especially not on a Saturday night, but we’re glad we ventured out this time. 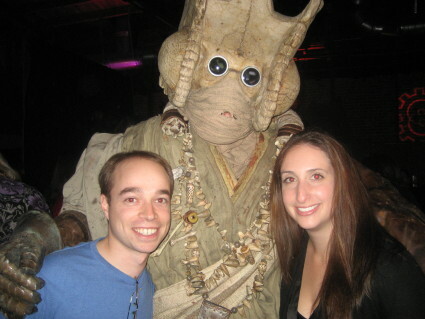 First we met my sister Suzie and her boyfriend Danny at Big Wangs, the ultimate anti-Hollywood bar. The place feels like a college-town sports bar on game night, full of people drinking giant pitchers of beer and eating high-piled plates of chicken wings and cheese fries. Then, around midnight, we headed over to Bardot, upstairs from The Avalon. Our friend Andrew had invited us to see Andy Clockwise play. We had some trouble finding the entrance, since there was no line and no bouncer visible, but the doorman finally showed up and we told him who we were there to see, and he let us in no problem. We walked up a flight of stairs and arrived at the luxe patio. There was draped fabric overhead providing an awning, neat architectural details like arched doorways, and pretty globe light fixtures lining the walls. It wasn’t too crowded and there were plenty of couches to sit on, and the DJ was playing an eclectic mix of indie and old-school songs. We hung out for a bit, meeting some of Andrew’s friends and people-watching — there were some really intriguing fashion statements going on. We saw a girl wearing a fur hat, another one wearing a wool winter hat with ear flaps, and a rather startling number of men dressed as nerds, with suspenders and giant plastic glasses. We also saw Harland Williams — he walked by me and said something like “Pardon me darling” as he made his way to the bar — and one of the Pussycat Dolls (don’t ask me which one). The three-person band finally went on at about 12:30, and they were great. We couldn’t hear the lyrics as well as we would have liked because the drums were a bit overpowering (we were standing right next to them), but the songs were really catchy and the lyrics we heard were inventive and funny. My favorite songs were one about open relationships where the drummer, Stella, got up and sang a hilarious relationship-drama duet with Andy, and one I believe was called “Let Them Eat Cake” about dance-floor divisions. There were plenty of other great songs, and I laughed every time Andy introducing his songs by announcing they’d be performing “The Rose” by Bette Middler or “Freebird.” The charismatic frontman also went into the crowd during some songs, climbing up on the small balcony across from where he was performing and up on the couches, too. I nearly got caught up in the cord for his microphone. The band played for about an hour, and our ears were ringing when they were done. We finally left a bit after two. It was a great night. 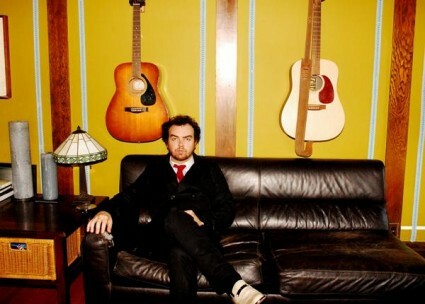 Check out an Andy Clockwise performance from another show (there was no keyboard player at Saturday’s show, and there were no photos/videos that I know of). 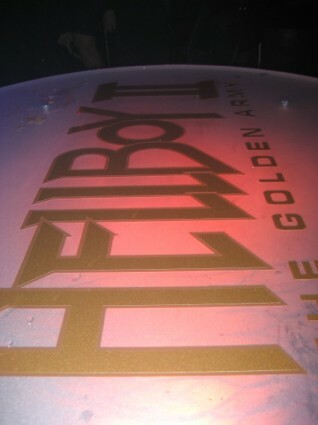 Last night, Evan and I went to the Hellboy II The Golden Army DVD release party (boy, that’s a mouthful). It was quite an event, and it looks like quite the Blu-ray DVD, with tons of special features, a 2 and a half hour documentary on the making of the movie, a director’s notebook, lots of commentary, a comic book creator and a “goggle view” that lets you see the movie in various stages of visual effects. We can’t wait to get our hands on one and check it out with our new Blu-ray player, which is still in the box. 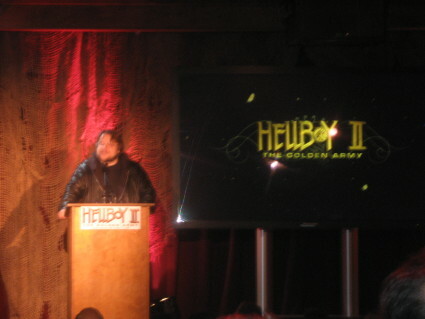 The party was a major production, which transformed the club Element into a scene from Hellboy, complete with monsters, burning trash cans, and actors from the movie. Evan and I had fun taking photos with the monsters who did an incredible job in their elaborate costumes. We’re pretty sure they couldn’t see a thing, and saw quite a few of them being led around the room slowly by hand. Some of their costumes were huge, too, and Wink’s mouth and hads were radio-controlled making him unbelievably life-like. There was also a rather funny panel discussion with Selma Blair, Jeffrey Tambor, Doug Jones, Mike Mignola, a Dark Horse exec and Guillermo. We learned that Guillermo liked to call Jeffrey Tambor “Jeremy” and Guillermo said that Selma and Doug “learned everything they know about handling a weapon from Charlie’s Angels.” The actors confirmed that and Selma added that when using her fake gun, she would say “Bang bang,” when it was supposed to go off, and she had to be reminded to keep quiet during her close-ups. Doug talked about the elaborate costumes he got to wear during the shoot since he played three characters, and they all talked about their favorite monsters — most were partial to the incredible Angel of Death. After the party, we went to an Italian restaurant next door to the club with the DVD producer, Javier, and his girlfriend Orso (the ones we baked the cake for), a concept artist, Francisco, and a few other people. We didn’t get DVDs, but we did get Golden Army toys and a big hug from Guillermo. See the rest of our photos in Evan’s Facebook album. 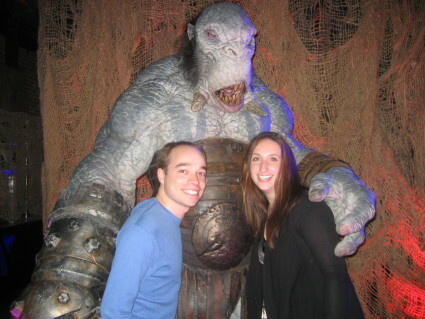 Tonight Evan and I went to the Hellboy II DVD release party. It was great — they turned the Hollywood club Element into a scene reminiscent of the Troll Market in the movie, complete with plenty of monsters, like Wink and the Butcher Guards, and tables that looked like burning trash cans covered with Hellboy II-branded plexiglass. Guillermo Del Toro made a presentation to show off some of the new Blu-ray DVD’s features, like the goggle view, which allows you to see the movie as it was shot and in two stages of temporary visual effects, and he also showed some behind-the-scenes footage from the set. Then there was a panel, with Guillermo, Hellboy creator Mike Mignola, Jeffrey Tambor, Selma Blair, Doug Jones and a Dark Horse exec, which had some funny moments, mostly from Doug and Jeffrey. More to come about the event tomorrow, but for now, check out our swag. 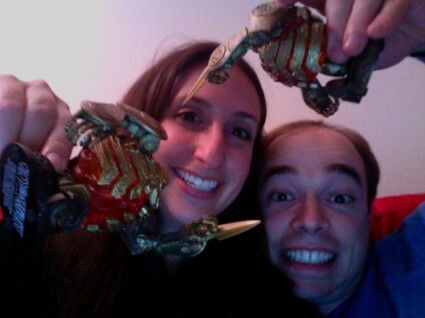 Unfortunately we didn’t get our own Blu-rays, but we did get Golden Army toys. I’m sure I’ll be posting a bit more, with photos and better descriptions, but Evan and I got back from our New York weekend today. We left from Gatwick airport Friday morning and had a 2-hour delay off the bat since our plane didn’t arrive on time. After an uneventful flight — Evan slept and I finished reading Youth in Revolt (very funny) — we got to Newark, took the train to our hotel (the W, very nice) and got ready to go out to dinner. We had Greek food (yum), went to see Towards Darkness (unfortunately the theater wasn’t very full, though it was well-received by the friends and family who came), and went out for drinks at the Thirsty Scholar (fun!). Saturday we went to MoMA (very cool, check out the photo), walked through Central Park (always lovely), had Mexican food in DUMBO (quite an adventure to get to, though the food was delicious), and went out with friends at B Bar. Sunday, we had brunch (I miss American-style brunch), Evan bought a camera, we had drinks with a friend, then spent a long time in Newark airport waiting for our flight (we were early). The flight was bumpy. Evan slept; I didn’t. I did, however, completely conk out on the train in from Gatwick. I also managed to take an accidental 6-hour nap this afternoon (oops) while Evan was at work. More about the weekend soon.